The London startup scene is the biggest in Europe and it's growing faster than any ecosystem in the US. It's the most diversified startup ecosystem in the world. It has an exceptional market reach and you can meet the most affluent clients and investors there. Finally, London-based startups know how to make use of the best talent pools on the planet. As I pointed out in my previous post, London has historically been one of the main cultural and business hubs of the world. This makes it an exceptional place for a startup at any stage of development. The list of opportunities you can find there is long, however there are also some challenges you need to be aware of. The global startup economy creates networks of companies clustered around the few dominating nodes. Each company – even the smallest and the most remote – is connected, but the power lies in the hands of the very few. The ‘winner takes all’ rule applies also to startup ecosystems. The biggest ecosystems attract most of the best companies. The Silicon Valley is the true world dominator, as the startups from Northern California were responsible for 47% of the value of all startup exits from the top 20 and 45% of their total VC investments, according to the most recent "Global Startup Ecosystem Ranking" provided by the company behind the benchmarking tool Startup Compass. 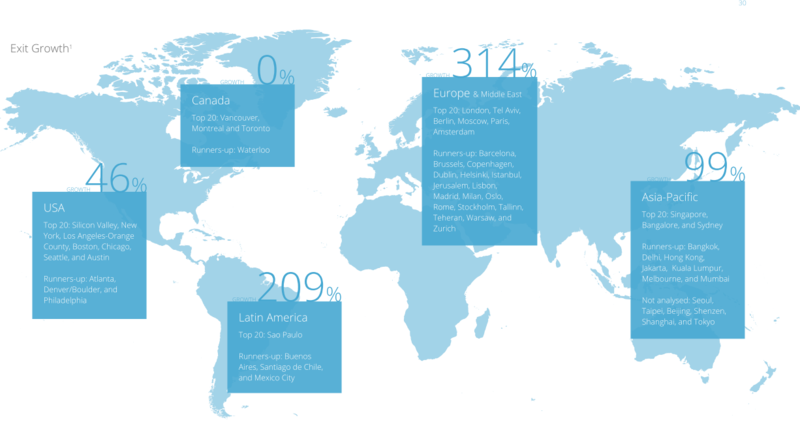 The London startup ecosystem is ranked 6th in the world. It's trailing behind NYC, LA, Boston, and Tel Aviv. Although still behind the top 5, the European hubs are actually growing the fastest, according to the report. The exit value of London based startups has quadrupled since 2012. The number of active tech startups there grew from 3,200 to 5,400 and they are now valued at $44 billion (in 2015). 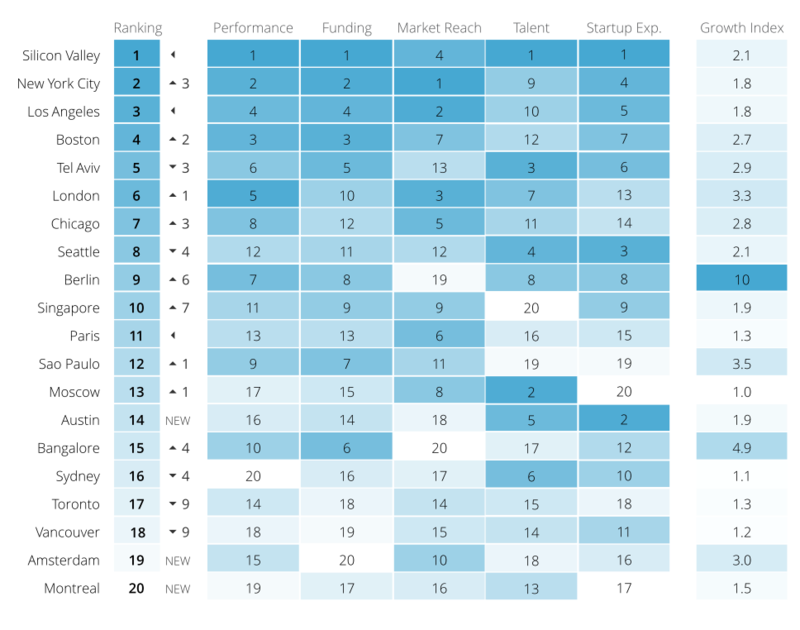 The city ranks #3 in market reach and #5 in startup performance, according to the report. We have worked with several successful London based startups and our experiences go in line with the report’s findings. Local government support for the "Tech City"
London ecosystem gives startups an easy access to affluent consumers and powerful corporations. Healthy funding and government initiatives make it even better. Being a global financial centre, London simply pays its workers more. Seed and Series A investments are 17% and 26% higher than European average. You can also rely on experienced managers, mentors and investors. As much as 23% of London-based founders gained previous experience in hyper-growth startups (highest value in Europe, but still 54% below Silicon Valley. The Startup Compass names London as the the most diverse ecosystem in the world, with 53 percent of foreign employees and 18 percent of female founders. This may be crucial for developing any product. It opens startups to a much bigger talent pool. The diversity helps build apps for global market. This has always been a barrier for tech teams. The underrepresentation of women made it more difficult for companies to design products that would cater to the needs of all customers. Startup Compass confirms what we’ve learned from our experience in London. They indicated that the biggest problem is the extremely hot labor market. London-based startups have been giving higher amounts of equity to employees compared to other ecosystems. On the other hand, UK's culture of labor mobility makes it easier for local startups to fight the brain drain. The tech talent in London has 20% shorter immigration time than the European average. Due to the drained talent pool the London ecosystem was able to evolve. The challenge is quietly changing into an opportunity as the companies learn how to work with remote teams. London’s startup scene hires one third of its employees from remote locations, which is 44% above the European average. The region is full of well-educated engineers, who speak good English and have much lower salary expectations than their Western European colleagues, not to mention their counterparts living in the biggest tech hubs. Traditionally, London has been perceived as Europe's gateway to the US and Asian markets. That's still true. There's also a new trend I'd like to draw your attention too: the tech companies operating in London use it as a bridge connecting global markets with the gigantic European talent pool. There are 24 official languages in the EU. Young specialists travel around the continent and work for international companies. For a large part of them English is becoming the professional lingua franca, especially in the tech sector. While corporations in big business hubs like London, Paris, Berlin or Amsterdam have drained the local talent, there are huge resources still available just a few hundred miles away. Educated young people from Poland, the Czech Republic or Hungary can easily compete with anyone in the field of engineering. And they are often better prepared for working in a remote, multicultural environment. The bridge, the gateway, the portal. Call it what you will. London is a unique place, where startups can have access to world's top clients and investors as well as world's top talent pool. The ecosystem is going to get more traction as working with remote teams becomes more popular and more efficient.